What do you do about hernia scar tissue? If you have a hernia you most likely need surgery. You might have had scar tissue in the spot before the hernia happened, but you will definitely have scar tissue at the hernia site after surgery. For most people, a hernia is a sudden event. Meaning, one minute you're fine, the next you have pain and a hernia. But realistically, it's not that simple. Realistically, the tissue that tears when a hernia happens has been weakening over time. Slowly becoming less and less structurally strong until *BAM* there is a tear. For the purposes of this topic, there's no need to spend more time talking about it. Pretty much nobody knows they have an impending hernia, so there's no need to talk about how to prevent a hernia and/or how to decrease scar tissue formation before a hernia event happens. In most cases, when a herniation happens, you need surgery. Connective tissue tears and other tissue pops through. Not a good scenario, and not one that is going to 'heal' on it's own. So usually, there isn't much time between the hernia event and surgery for scar tissue to form. And realisticaly, it would be painful, or at best unpleasant, to 'work' the area to prevent bad scar tissue formation, and nobody is going to do that. So there's not much else to say about this aspect of hernia scar tissue. How to reduce hernia scar tissue after surgery. Here's where we can get to work. Hernia event: intestines pop through tear in connective tissue. Hernia repair surgery: surgeons cut through skin, push intestines back inside, then reconnect the torn edges of connective tissue with stitches or staples, then reconnect the cut edges of skin. Scar tissue begins to form. Ideally, the goal is keep healing tissue healthy, meaning, as new collagen fibers lay down they form healthy (meaning: structurally strong) tissue instead of 'scar tissue' (meaning: structurally weak). But most people don't try to do anything about scar tissue until they realize there's a problem. In a perfect world, you start working on the surgery site a week or two after surgery. As we live in a not-perfect world, get started on it whenever you can (any time after the incision seals back together, even if it's years later). 2. 'Stretch' the skin around the incision site. engage the skin and press in one direction, then another. Meaning, put your fingers/knuckles/palm/whatever on the skin anywhere around the incision, press in, and push towards your feet or head or right side or left side or combination thereof. Push and hold for a few seconds, then go a different direction for a few seconds. When incisions heal, when scar tissue knits a wound back together, it pulls on tissue in all directions towards the incision site. Not only does this put tension on connective tissue where there wasn't any or as much before, but it also puts tension on the incision site. if you're doing this close after surgery, then you can prevent the build up of scar tissue mass, which is MUCH HEALTHIER TISSUE. This scar tissue can cause an adhesion. 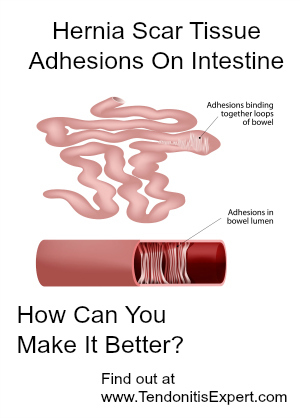 Which means, that the folded hose of the intestine can stick together. This is not idea, as it can inhibit the natural ongoing movement of the intestines. This may or may not become a problem after a hernia, but if it is a problem, or if you want to do some proactive work so that it DOES NOT become a problem, great. At a very simple level, your tissue is either a soft squishy sponge, or a dry half-squeezed crunchy sponge. Scar tissue becomes dry crunchy sponge. How do you make a dry half-squeezed crunchy sponge into a soft squishy sponge? You squeeze it (under water) over and over until it turns soft and squishy. Internal fluids are the 'water' here, you don't need to worry about that. What you need to worry about is trying to 'squeeze' the 'sponge'. The hard part here is you probably won't be able to feel exactly where the adhesion in (maybe you can, even better). But you don't have to be able to feel it directly. Work the incision site as described above. Work the incision site as described above, but press deeper down towards your spine. This will help connect with any scar tissue/tissue that is connecting intestine to the incision. Go out several inches from the incision site, then press in at an angle (trying to get to the area between the incision site and your spine) and rub back and forth and around. Try different angles, and vary how far away from the incision you are pressing in at. This may be tender at first. That's ok. Don't hurt yourself, obviously, but over time, work your way in deeper and deeper. Over time as you do this, overall it will get less and less tender. If you find more-than-tender spots in there, or hard spots, that is a clue that you're putting pressure on scar tissue. DO REMEMBER: that there is digesting food in your intestines, so as you're pressing around if you feel hard spots...that might be 'food' in there so be gentle as you massage in there. Don't hurt yourself. Return to the top of this Hernia Scar Tissue page. Go to the main Scar Tissue page.